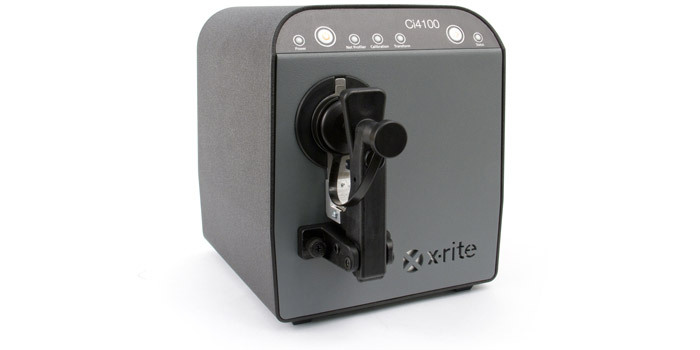 The Ci4100 is an affordable compact benchtop sphere spectrophotometer specifically designed for versatility ease of use by counter personnel for retail paint matching. Quickly determining formulation recipes for matching paint to customer-supplied samples enhances customer satisfaction and paint counter productivity. The Ci4100 is an easy-to-use and compact benchtop sphere spectrophotometer that delivers a high degree of formulation accuracy for retail paint matching. Its sample arm makes targeting and view of samples fast and easy. The LED screen on the Ci4100 offers status and operation feedback as well as visual cues about proper calibration and operation of the instrument and/or whether service is required. Its robust construction stands up to the harsh retail paint environment for a long-lasting instrument, a great investment to improve retail paint counter efficiency. Fast, accurate measurement of customer-provided and other samples. Delivers correlated 60⁰ gloss value to accommodate matte and glossy samples in compliance with ASTM standards. Sample arm provides easy targeting of samples for accurate measurements. LED screen gives operators feedback on instrument status and operation as well as visual cues about calibration requirements and whether service is needed. Good inter-instrument agreement with X-Rite handheld sphere spectrophotometers.